Enhance your adventure with a Discovery Journal! Discovery Journals include activities for kids to investigate the connections between the design, plants, wildlife, and people in the Park. Downloadable and print versions are available for the North Woods, the Ramble, the Harlem Meer, Turtle Pond, the Pond, Shakespeare Garden, and Conservatory Garden. 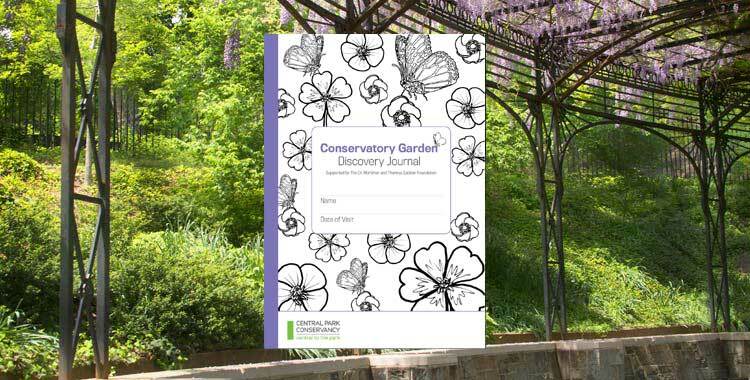 Downloadable Journals: The North Woods, The Ramble, The Harlem Meer, Turtle Pond, The Pond, Shakespeare Garden, Conservatory Garden, The Mall and Bethesda Terrace, and Hallett Nature Sanctuary. Printed Discovery Journals are available at all visitor centers. Enrich your family or school group's visit by downloading our Exploration Guide prior to visiting Central Park. These guides are designed to complement the Woodland and Aquatic Discovery Journals by providing information on the ecological features unique to each area. Guides include a map with suggested route and activities for developing kids' observation skills. 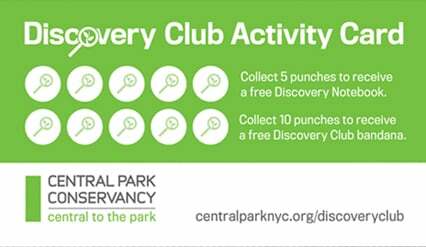 Complete a Discovery Journal and receive a punch on your Discovery Club Activity Card! Participate in our free family programs and collect rewards along the way.